Sarah Nader- snader@shawmedia.com Huntley's Nicholas Dennis huddles with his team after they lost Saturday's Class 8A playoff game against Loyola at Huntley High School Nov. 12, 2016. 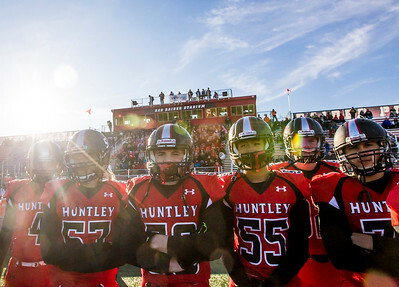 Huntley was defeated, 24-0. 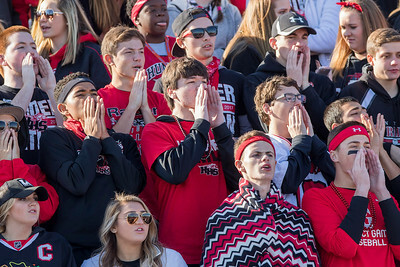 Sarah Nader- snader@shawmedia.com Huntley players watch the last seconds of Saturday's Class 8A playoff game against Loyola at Huntley High School Nov. 12, 2016. Huntley was defeated, 24-0. Sarah Nader- snader@shawmedia.com Huntley's Hunter Kowalski (center) is carried off the field by Tyler Szekely (left) and Ben Stevens after getting hurt in the third quarter of Saturday's Class 8A playoff game against Loyola at Huntley High School Nov. 12, 2016. Huntley was defeated, 24-0. Sarah Nader- snader@shawmedia.com Huntley's Eric Mooney pushes off Loyola's Anthony Rodriguez while running the ball during the third quarter of Saturday's Class 8A playoff game at Huntley High School Nov. 12, 2016. 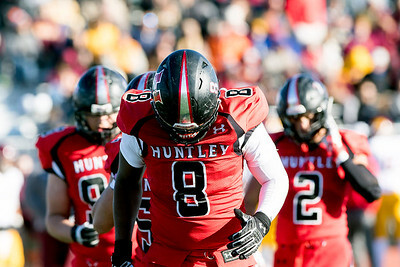 Huntley was defeated, 24-0. Sarah Nader- snader@shawmedia.com Huntley's Brian O'Mara runs the ball during the third quarter of Saturday's Class 8A playoff game against Loyola at Huntley High School Nov. 12, 2016. Huntley was defeated, 24-0. Sarah Nader- snader@shawmedia.com Huntley's Olalere Oladipo walks off the field during the second quarter of Saturday's Class 8A playoff game against Loyola at Huntley High School Nov. 12, 2016. Huntley was defeated, 24-0. 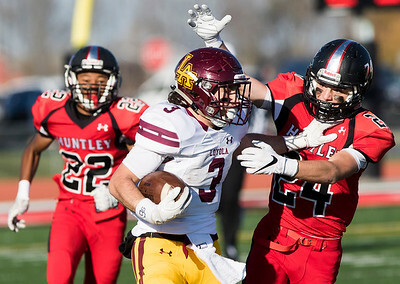 Sarah Nader- snader@shawmedia.com Loyola's Kyle Rock (left) pushes off Huntley's Tyler Koss during the third quarter of Saturday's Class 8A playoff game at Huntley High School Nov. 12, 2016. 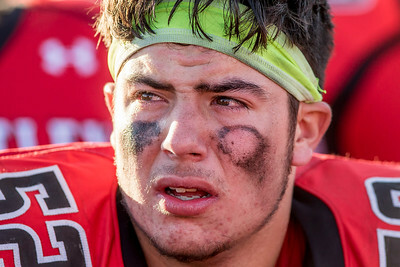 Huntley was defeated, 24-0. Sarah Nader- snader@shawmedia.com Huntley's Tyler Koss (left) tackles Loyola's Jake Marwede during the second quarter of Saturday's Class 8A playoff game at Huntley High School Nov. 12, 2016. 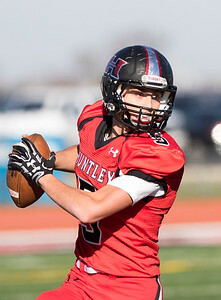 Huntley was defeated, 24-0. Sarah Nader- snader@shawmedia.com Huntley fans cheer on the football team during Saturday's Class 8A playoff game against Loyola at Huntley High School Nov. 12, 2016. Huntley was defeated, 24-0. Sarah Nader- snader@shawmedia.com Huntley's Brian O'Mara catches a pass during the second quarter of Saturday's Class 8A playoff game against Loyola at Huntley High School Nov. 12, 2016. Huntley was defeated, 24-0. 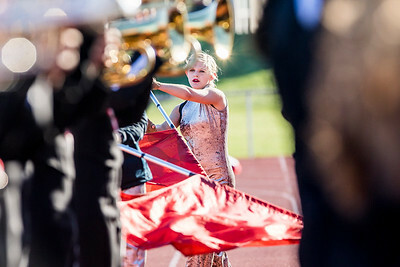 Sarah Nader- snader@shawmedia.com Huntley's Sage Amour, 15, performs with the marching band during Saturday's Class 8A playoff game against Loyola at Huntley High School Nov. 12, 2016. Huntley was defeated, 24-0. 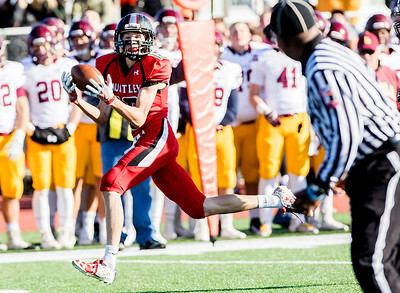 Sarah Nader- snader@shawmedia.com Huntley's Eric Mooney throws a pass during the first quarter of Saturday's Class 8A playoff game against Loyola at Huntley High School Nov. 12, 2016. Huntley was defeated, 24-0. 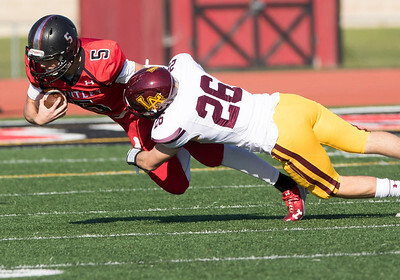 Sarah Nader- snader@shawmedia.com Huntley's Eric Mooney (left) is tackled by Loyola's Charlie Largay during the first quarter of Saturday's Class 8A playoff game against Loyola at Huntley High School Nov. 12, 2016. Huntley was defeated, 24-0. 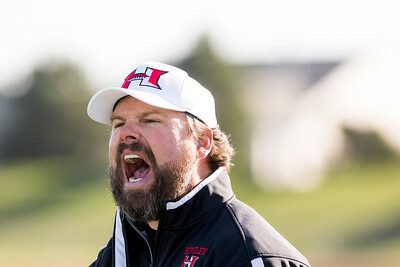 Sarah Nader- snader@shawmedia.com Huntley head football coach Matt Zimolzak screams at the referee during Saturday's Class 8A playoff game against Loyola at Huntley High School Nov. 12, 2016. Huntley was defeated, 24-0. 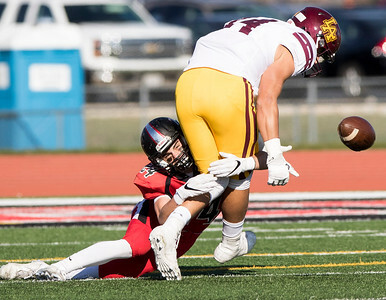 Sarah Nader- snader@shawmedia.com Huntley's Tyler Koss (left) tackles Loyola's Jake Marwede during the first quarter of Saturday's Class 8A playoff game at Huntley High School Nov. 12, 2016. Huntley was defeated, 24-0. 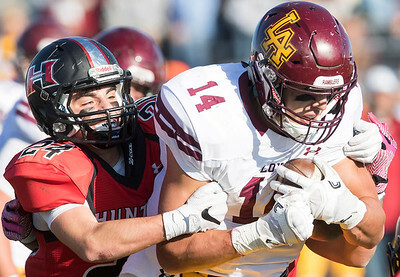 Huntley's Eric Mooney (left) is tackled by Loyola's Charlie Largay during the first quarter of Saturday's Class 8A playoff game against Loyola at Huntley High School Nov. 12, 2016. 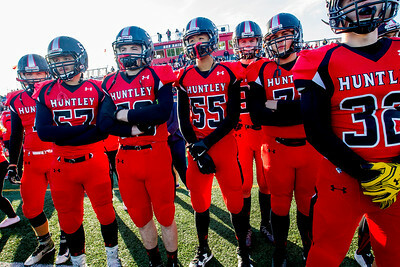 Huntley was defeated, 24-0.